My entire clay journey has been based on using porcelain . It's bright white surface was a perfect for my graphic decorating style. I could scratch into it, build up flat colors, use silk screen transfer, play with water etching, water down underglazes and use them like water colors without having to take into consideration the effect that the clay color would have on the process. I LOVED the simple white canvas porcelain provided BUT it never LOVED me back! From the start I dealt with an insane amount of flaws and cracking. It seemed that the porcelain I was using wasn't at all happy being subjected to the stresses of hand building. I changed clay bodies several times over the years and though the cracking problem got better it NEVER stopped. I began to dread the day that I had to check the drying pieces I had so painstakingly made and decorated for cracks because without fail I could count on losing a large percentage of them. It began to effect my creative thought process. I tried to alter my vision to accommodate inevitable failures. Ever the optimist, though, I thought if I kept trying I would discover the magic formula and solve my porcelain problem. Finally the other day I had had it! I had made the simplest vase form I could think of ...a cone. I made 24 in anticipation of Easter and Mother's Day sales. They were decorated and drying SLOWLY. After dying under plastic for two weeks I checked them ...out of 24, 10 had made it ! 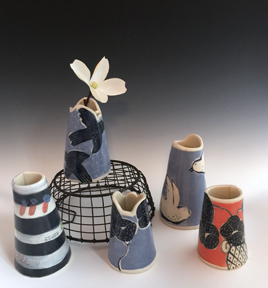 Pretty little porcelain cone vases - available at Abrams Claghorn Gallery. I recently bought Sunshine Cobb's wonderful new book on handbuilding. She made working in red clay seem like a joy. I drove to my local clay supplier, Leslie Ceramic and picked up a bag of Navajo Wheel. Upon rolling out my first slab I knew I was in for a treat. This clay had a bit of tooth but was smooth, responded to my touch and didn't fight being formed...it seemed happy being darted, pushed out,seamed, cut, formed. It also looked exactly like the chocolate refrigerator cookie dough that my mom used to make....YUM! I was and continue to be in HEAVEN working with this stuff. But the real test came in the drying process. After one week under plastic and one week without cover...not a single crack! HALLELUJAH ! Fresh slab of delicious Navajo Wheel ready to be made into something sweet. At first the decorating process seemed a little daunting. But by starting with a layer of white slip I am able to use most of the techniques I have developed over the years. The one exception is mishima but by scratching through the white slip to the dark ground I can achieve the same effect. As I continue to explore the new possibilities I am actually enchanted with the depth that the dark richness of the Navajo Wheel brings to my designs. Change is Good! Bisque loaded ...first test came out great.